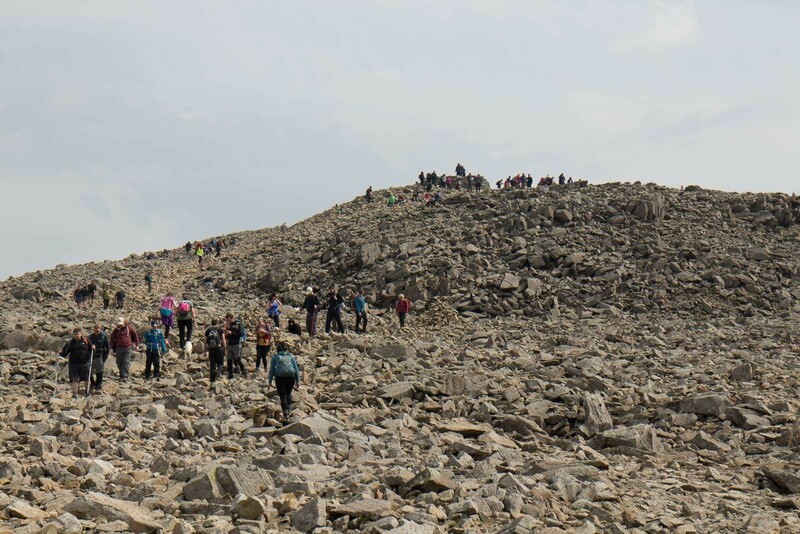 Popular and busy route up Scafell Pike. 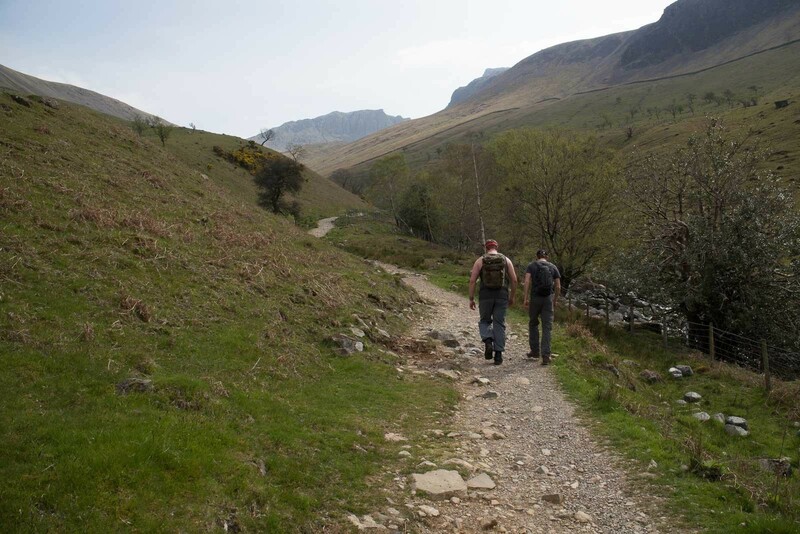 This is the popular walk up Scafell Pike from Wasdale head, and is the usual three peaks route up Scafell pike. It starts from the NT car park by Wastwater. 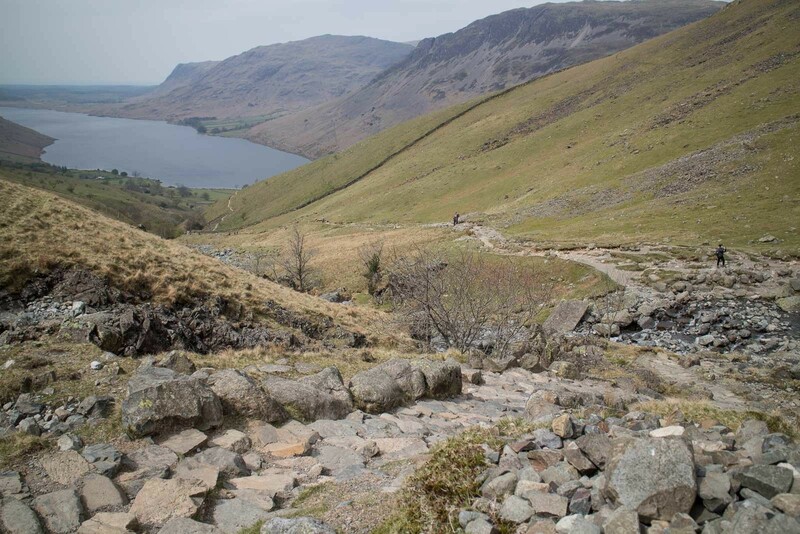 This is the most popular route from Wasdale Head, but don’t let that make you complacent. The path becomes indistinct half way up and the final ascent could be tricky in mist. 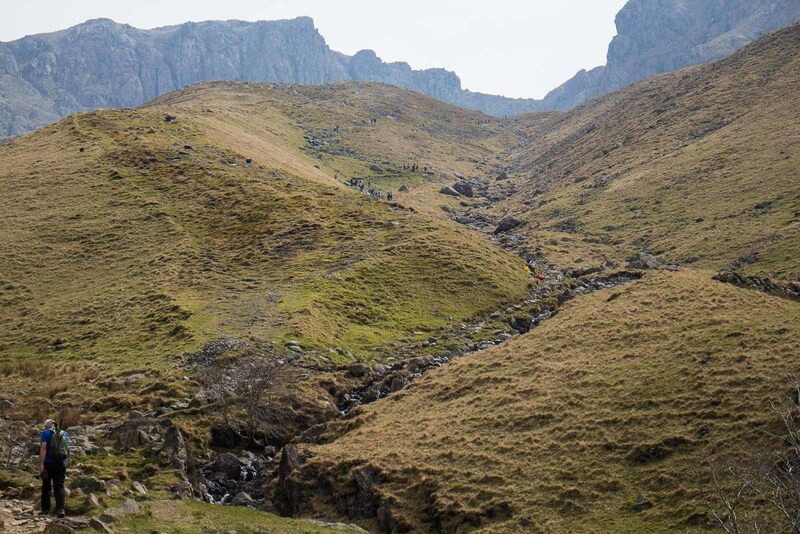 Even if it is the ‘tourist’ path, it’s still an interesting ascent to England’s highest mountain, with only it’s popularity counting against it. 1 The walk starts from the National Trust Car Park at Wastwater, next to the Campsite. There’s very little messing with the route as it sets off along Lingmell Beck, crossing it and then following it steeply uphill. 2 After 1.5km, the path fords Lingmell Beck, with the crossing not overly obvious, but straightforward. 3 Once you’ve crossed Lingmell Beck, you’ve got an even steeper ascent up Brown Tongue to follow. It’s steep, but thankfully only around half a kilometre and the steepest section on the route. 4 After Brown Tongue, the route relents, but the path begins threading and the route ahead may not be immediately apparent, especially in mist. 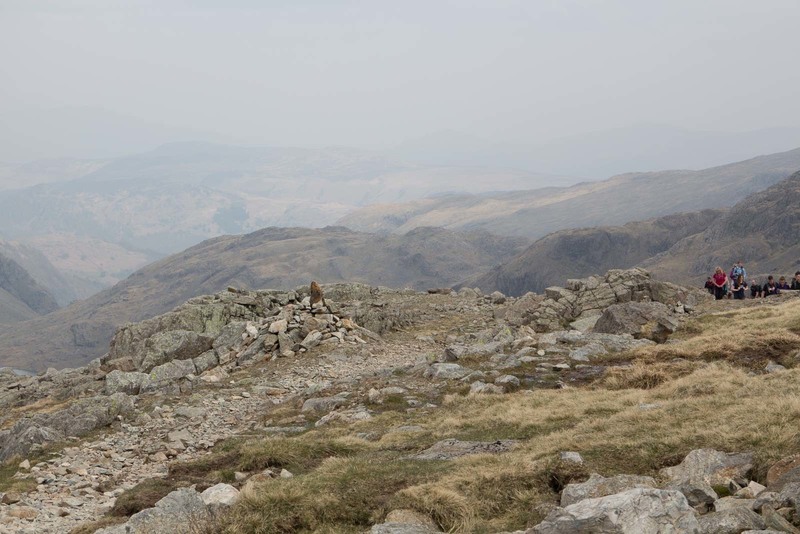 You need to ensure that you veer left towards a large cairn at the top of Brown Tongue across Hollow Stones and that you don’t veer right to Mickledore. There are plans to modify the maps in order to make the route here clearer and easier to follow. 5 The next section of path is steady to Lingmel Col, and easier on the legs than what you’ve already walked up. The path is clear and shouldn’t pose any problems. 6 After around 1.5km, you should reach Lingmel Col where the Path turns right. It is joined here by the Corridor Route, just make sure you don’t join the Corridor Route! The final ascent has a largely clear path, if a bit loose in places that zig zags it’s way up the final 200m of ascent. 7 The summit plateau is finally reached, with the summit itself being a slight climb. There’s a rather strangely placed trig point next to the higher summit cairn. Jostle here with everyone else in order to bag England’s highest point, and an extensive view of the Lakeland Fells. 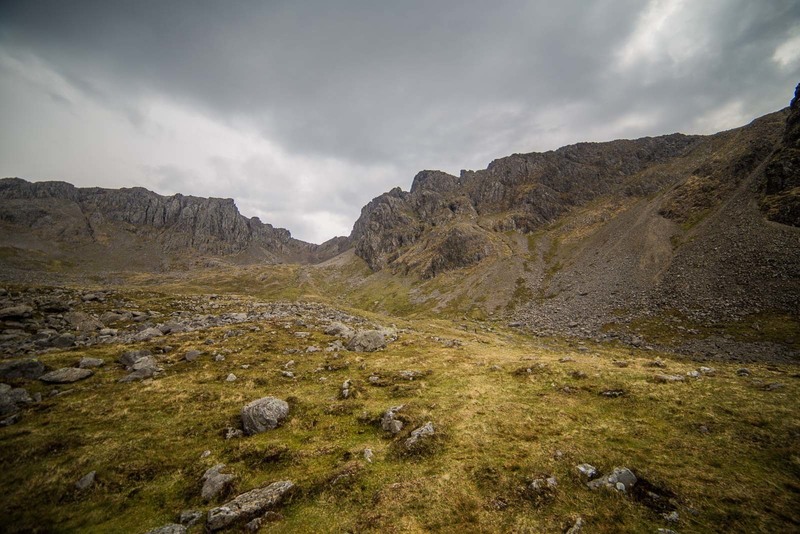 You can descend by the same route – or alternatively you can either loop around and descend via Sca Fell or return via the Corridor Route to Wasdale Head. In descent, take care at the junction with the Corridor Route not to take the wrong route down, or to veer off in mist as you do not want to end up in Pier’s Gill! We descended today via the Corridor Route as far as Sty Head, a fascinating route down that crosses the spectacular gills that are a particular feature of this mountain. 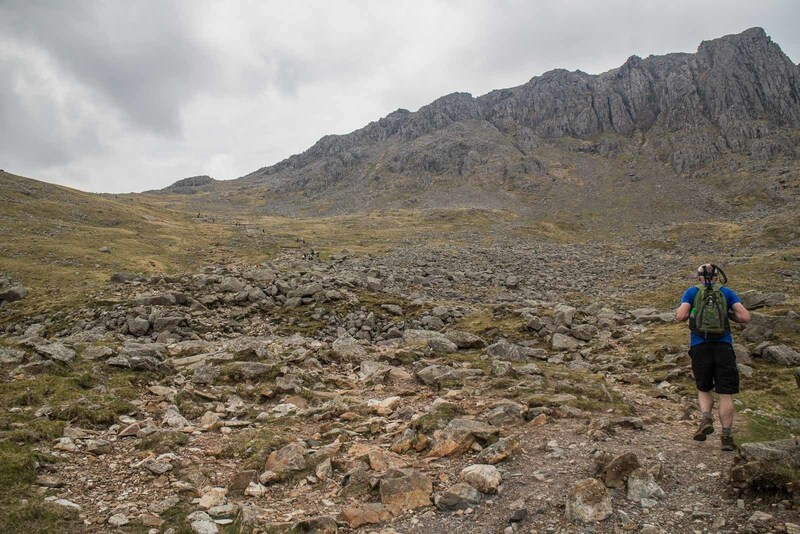 A workmanlike track up Scafell Pike – does the job. Great info, but as a complete novice that will be attempting this for the first time, can somebody confirm if when Wasdale Head is mentioned it actually just means Wasdale?? Sorry, dont wish to sound picky, just want to make sure.